Since our last post on poaching, which some people may have taken with a pinch of salt, we now sadly report on a poaching incident in the Forest of Dean. 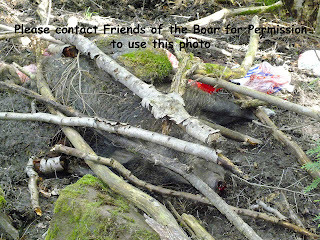 Last Saturday, the 12th May 2012, a Friend of the Boar came across the butchered and hidden remains of a sow he had been following for weeks. The sow had been quite tame and so were the nine piglets she had with her. They were also accompanied by another non-lactating sow, presumably too young to have had her own piglets. She was a delight as were her piglets, and like the Beechenhurst Six last year, could have become a much loved presence drawing in tourists from far and wide. It is interesting to compare her to the Beechenhurst Sow because not only did she look like her, but was known to wander in an area adjacent to Beechenhurst Lodge - is there a connection?. Little piglets about 1 month old. Please see http://www.scottpassmore.co.uk/ for more images. (please note that Scott is not the person in question who found the butchered sow but is equally saddened to hear of the loss of such a friendly sow he had got to know well). Unfortunately her tameness was her downfall. She appears to have been killed at very close quarters (details still required). Her body was left, presumably on the spot where killed, minus her leg, and covered over with branches and rocks so has not to be discovered. Photos Reproduced by Permission of photographer. The person who had been following her had last seen her alive in that area the evening before her subsequent discovery in the morning. What is remarkable about this story is the worry that there are people wandering the Forest at night with weapons, yet do not have vehicles nor the planning to remove a smallish boar wholesale! Although expert at butchery, they seem otherwise at a loss with taking away the remains other than a leg! It is the sort of stuff more akin to an SAS survival course whereby the meat removed was for personal consumption rather than to sell. The taking of the life of a boar with dependent piglets seems of no moral consequence to them. Who knows the real minds of these sick and obviously intellectually-challenged people? The person who found the sow immediately called the police. They arrived at the scene, and although too squeamish to touch the body, at first attributed the death to a road traffic accident and appeared disinterested in pursuit of a poacher (the fact a leg was missing seemed unimportant to the officer in question). The police officer took photos and called for the FC to come and remove the body, which they did later that Saturday. So yes, the killers had left the boar there all night having removed just a leg. The boar remains was about 500 metres from the road and would not have been difficult to transport by 2 men. They clearly did not want the rest of the animal. 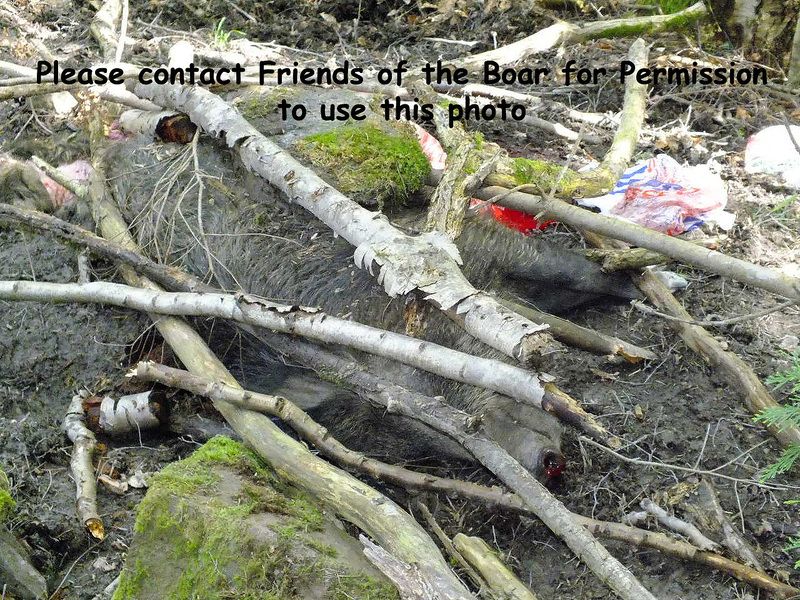 The police and Forestry Commission have today released a document (click here) stating that indeed, they now believe the sow to have been killed illegally rather than run down by a car. Clearly, these people would not have been able to kill if the boar had not been tame. 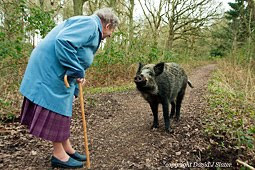 The tameness may be inherited behaviour, but these boar would quickly revert to wild and nervous if left alone. People who feed the boar are ultimately giving the boar a death sentence when people like the perpetrators of this cowardly poaching are at large. We are all united now, the police, the Forestry Commission and Friends of the Boar in condemning anyone who feeds wild boar. 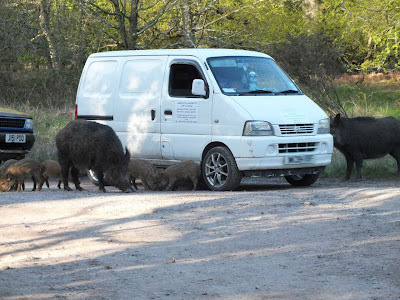 This van's driver regularly fed the sow (this side of van) and her piglets at a layby near to Speech House. The other boar is a young sow that was not suckling. This person is partly responsible for the sow's death and potential starvation of nine piglets. 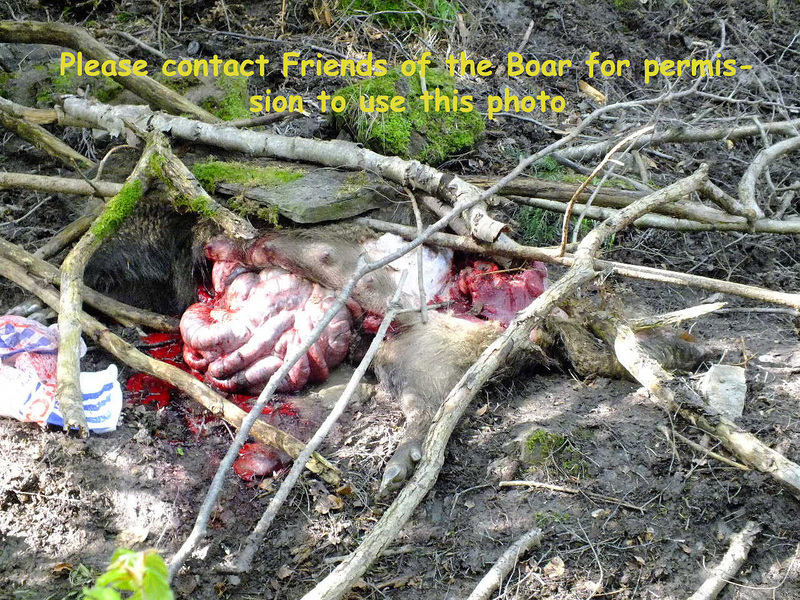 We know who this is, and Friends of the Boar will always photograph anyone feeding the boar. Reproduced by Permission of photographer. As we speak, the piglets are still alive and being looked after by the other sow. Let's hope they learn to avoid humans! Disgusting, how can people kill something like a Sow Boar, they should be thown in prison for ever. 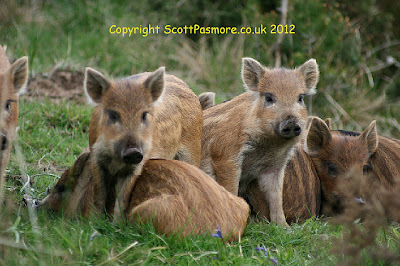 I bumped into this sounder on the 5th of May 2012 in between Beechenhurst / Boys Grave - two sows & 9 piglets. 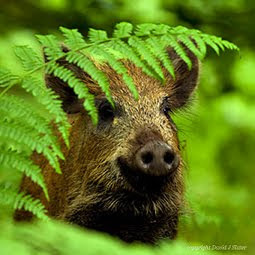 I have been fortunate enough to have seen Wild Boar in the Forest on several occasions and bar this encounter on the 5th, I have always been alone and had time with the Boar in peace & quiet. On the 5th the Boar were out near the road rooting for food and this attracted a fair amount of cars that pulled over - I pulled over myself further up the road and I filmed the Boar from a sensible distance so as to keep the disturbance to an absolute minimum - the animals welfare is always my priority. I was surprised to say the least to see cars pulling up, people getting out and going right up to the Boar sows (I mean literally right next to them) and proceed to take photos - including one guy who was posing next to the Boar. Another couple arrived and they were attempted to feed the piglets grass by hand, one guy saw me keeping my distance and he shouted "you can come closer mate, they are used to people now" to which I told him no - people need to realise these are wild animals and they should keep a sensible distance and show them some respect. 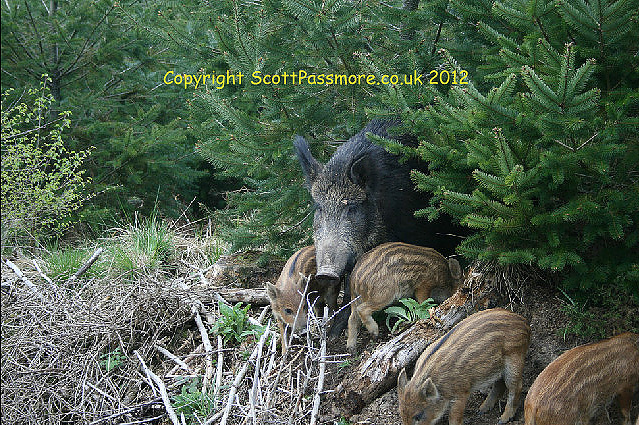 I remember getting back in the car and thinking to myself how certain Boar were becoming more vulnerable by coming out into the open like this - I was right. A video of the two sows with the piglets is available via my Youtube. We agree with your comments. Could you add a link to your youtube video? I'm sure many would like to see it. There was a suggestion last year to set up some sort of community group to promote appropriate human behaviour around the boar, and to keep a watch on their welfare. I've been doing this as an individual but would be interested in being part of something more collective. I'm wondering if I need to join the Friends of the Boar to do this? In Robin's column in the Review last week he directs readers to this website for 'more information on ways you can help'. I may have missed something but far I haven't found this information here, and having had no response to my previous comment asking about how to help I'm somewhat at a loss as to what to do next. Have gone back to the January blog and see that the bit about public education and a community task force was described as a District Council initiative, so I'll take it up with them. In the meantime I'm still hoping that someone from the Friends of the Boar group will respond to my earlier comments, in particular whether this a group that is open to new people keen to help. Friends We are human please keep some feeling for animals also..